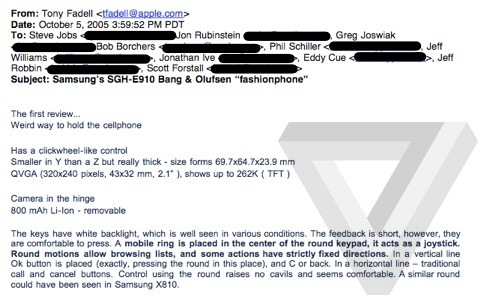 While yesterday’s court case revealed a bandwagon full of Apple’s long-held secrets, an interesting email involving Steve Jobs, Jony Ive, and Tony Fadell surfaced. 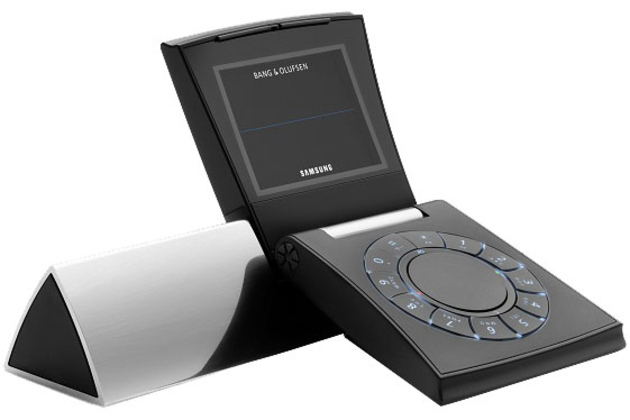 It turns out Samsung’s allegations remarking that both companies were inspired by each other, may actually hold true. 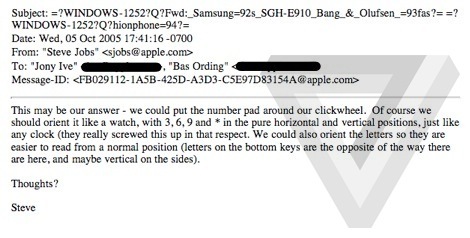 This evidence was presented by Samsung in attempt to further prove that both companies were nothing more than inspired by each other’s designs. And Samsung got the point across fairly well in my opinion. Set aside from this being evidence, it amazes me some of the prototypes Apple considered during the past. This is the craziest one yet — it looks like the iPod’s clickwheel with numbers around the perimeter.